Local “one-box” results (as they’re called) show only one Google My Business page, alongside some organic results. 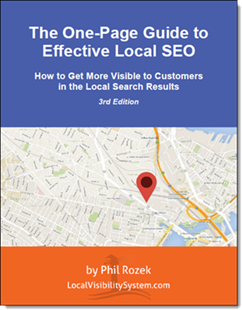 It’s good for your business to have a one-box result any time you can nab one, because of how visible you are on the page: You’re the only business on the map (on the right), and you’ve got an organic ranking (off to the left). Scenario 1: You search by name for a specific company near you. Scenario 2: You search for specific company that isn’t near you, but that has such a distinctive name that Google knows you want to see search results for that company. 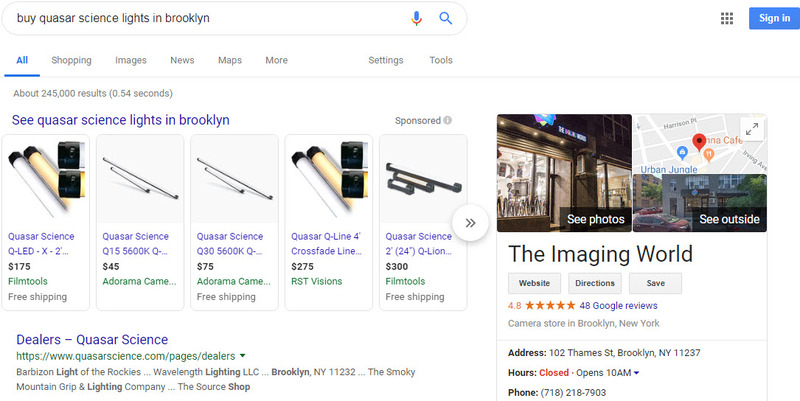 Scenario 3: Google falsely assumes you wanted to see results for a specific company, when in fact you searched for a term broad enough that you thought several local businesses would show up. Scenario 4: Google concludes there’s only one business near you (or in a specific city or area you search in) that provides the service or product you’re looking for. I won’t be talking about scenario 3, either, for two reasons. 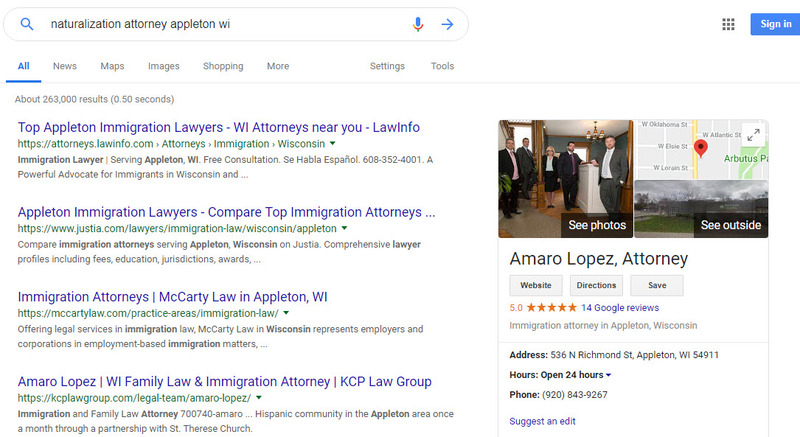 The first reason is that one-box visibility is a fluke in that case (Google incorrectly assumes people are searching for a specific company by name). 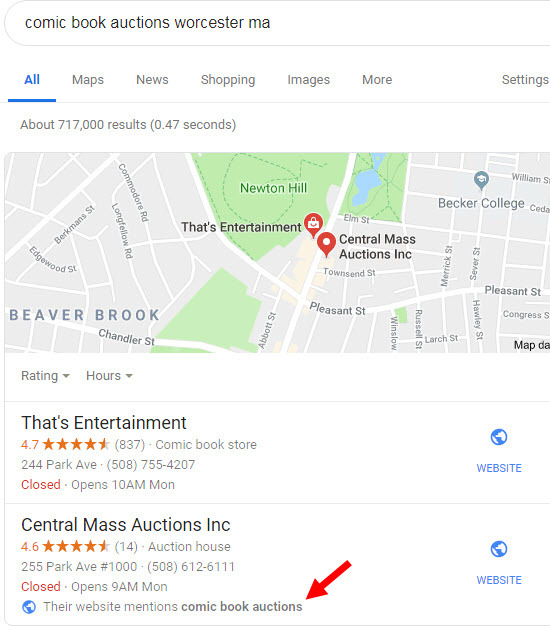 The second reason is that usually the only way to try to confuse Google into giving your business a one-box on the local map is to use a fake name for your Google My Business page, or to stuff keywords into the name. Neither strategy is one you want to bank on. Scenario 4 is a card you can play: If you can appear (to Google) to be the only business nearby that offers certain services or products, you can engineer more one-box results for your business. How, exactly, do you go about that? 1. Create a separate page on your site about each specific, preferably “niche” service or product you offer. I don’t mean a page on something broad or that’s saturated with local competitors, like “Personal Injury Law” or “Riding Mowers.” I mean you need a page on “Banana Peel Injury Law” or “Duffer 9000 EZ Riding Mower,” or on whatever is the most specific way to characterize your service or product. 2. Point some internal links to that page: maybe one in the main navigation, another in the footer, one on the homepage, one on the main “Services” or “Products” page, and wherever else seems appropriate. Don’t go crazy with the internal links, but err on the side of more rather than fewer. That’s it. Of course, not much will happen until Google has indexed your page, but steps #2-3 may help expedite that. Though I doubt you need search-term-relevant links or reviews to get one-box results for niche services or products, scaring up some reviews and links wouldn’t hurt, and is a good idea anyway. Is it possible other ingredients go into Google’s one-box sausage? Sure. It’s also possible that Google’s rhyme and reason will change later. But in my experiments for clients and observations on others’ businesses, the above 3 steps are all you need to do. What if you want to get a one-box for more-competitive, non-niche search terms? That’s a tough putt (even if you take a spammy approach), because Google knows of other businesses relevant to those search terms. In that case, you’re vying for 3-pack rankings. Any Google Maps one-box results you get will be in addition to – not instead of – your organic rankings for those products or service. It’s not an either-or deal. Local SEO is mostly organic SEO in disguise. 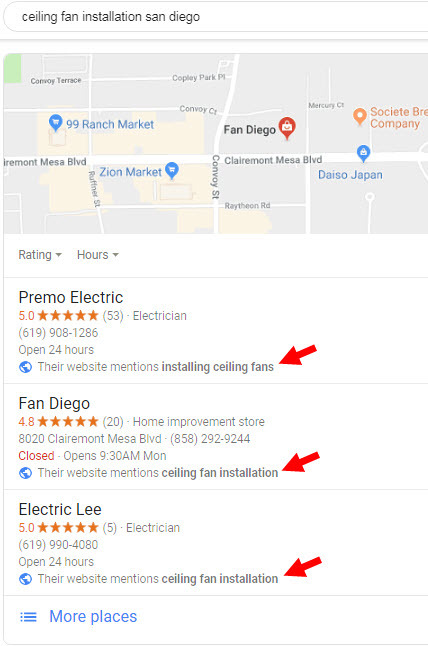 A bonus: even if you don’t get a one-box result, but you show up alongside local competitors in a Google Maps 2-pack or 3-pack, you’ll get the “Their website mentions [service or product]” snippet showing up under your name on the map. That may help get you more clicks from the right searchers, among other benefits. I’ve long said that you need a page on every distinct service or product you offer – preferably in-depth pages, and preferably on your more-niche offerings. When clients and others have asked why they should bother, my reasons have always been (a) “You’ll convert more of the people who are looking for something very specific, and (b) “You want to show up in the organic search results, especially when there’s no local map.” But these days, more so than I’ve ever seen before, creating a solid page on each offering will also grab you more visibility on the map. Have you tried rustling up some one-box results? If so, what did you try, and how did it go? Do your competitors have any one-box results you just can’t figure out? I have been thinking of adding more content in this way to some sites but I wonder about determining value. I would think very specific long tail phrases that are your perfect customers would be worth exploring but then you get into volume and size of your city. Over the years we have chanced upon or lucked into things that work. Sometimes it reflects some application of long tail phrases. They are niche and directed. They add traffic. The age old adage about seo was and still is that long tail traffic works for sites. In his endless research Phil has also found some or more of these things. To the benefit of many he writes about them. This is one of those examples. It works. It has added organic traffic. We’ve seen it convert to GMB traffic with a one-box. Frankly I should do more of it. Thanks for the great description, Phil. Yeah, the search volume is the big question. To that I’d say you’ll probably want to create those pages anyway (and add internal links where appropriate). 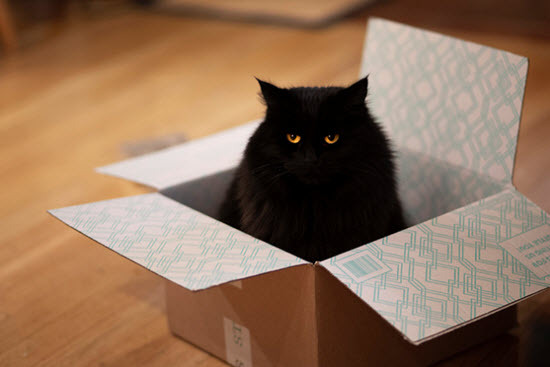 The one-box strategy doesn’t involve extra work. It’s just an additional benefit to the same work. To the extent creating “niche” pages is a lot of work, I say (1) apply the 80/20 rule, and (2) make a few before making a ton. Phil, Once again you have prepared a well written blog. I love the examples. The kitty gifs are certainly fun, too! Thanks, Beverly. Glad you like the kitties (they don’t like us back). Like Dave says! This works. Done it for years – not as a specific action but using video to create niche detail that for the clients that have participated, has moved them to dominate in their niche/city. I echo, great description Phil! Thanks, Mark. Yeah, the videos can be great (in their own right, and as a supplement to one-boxing). Nice job Phil. I have to confess, I don’t think I’ve seen this type of one-box, but probably because I don’t spend any time looking. Now I have one more thing I need to work on. @Jeffrey, this is definitely not going to generate lots of volume, but each tactic you employ that increases your leads will slowly add up over time. A few new leads here and there, pretty soon we’re talking about real money. Well-said, Tony. Organic + one-box visibility for your relatively niche services can add up. It’s “manufacturing runs,” as they say in baseball. @Tony: If you get the organic and the one box for very specific niches that also are closer to the buyer iintent–they are “better leads”.–closer to buying. We have valued them over the years. If you get and hold on to the one box and its a better quality lead–its free. Don’t sweat the volume. Look for another valuable niche on your product/services. Its the long tail. By definition its not high volume. If you have a lot of valuable long tail–that is the thing that creates volume. Thanks Phil, a good takeaway for local businesses. Really appreciate your advice and the time you take to share with everyone. 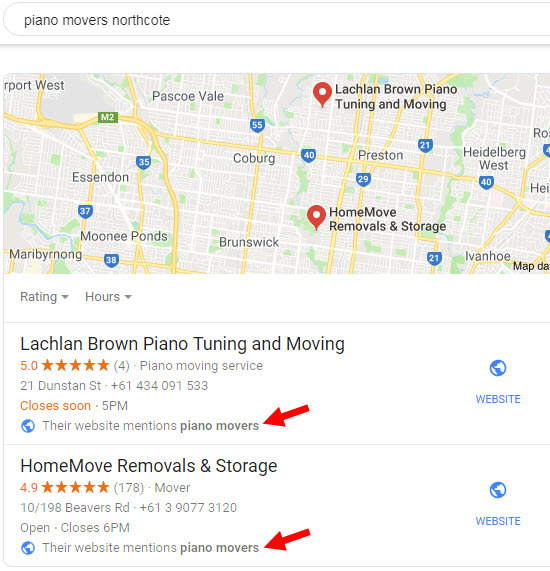 Excellent Phil, and it may be worth mentioning that Google My Business Posts using the same keywords may also help, (both video, and text+image posts). This Position ZERO on maps is similar to the Position Zero on search I think. You have to reverse engineer it. Certainly, one of my strategies is to search key terms and find the position zero boxes on search and then create my own for local businesses. This is a great way of getting focussed content on a website. What does “position zero on maps” (emphasis added) refer to? I’ve only seen “position zero” – the answer boxes – in the organic results. I’m calling your one map result position zero on maps now Phil. It seems logical to give it this name…I need a name to explain it to people!!! As always, I appreciated the info you share! One question, do you have an example of a site that combines some of your key points such as content on home page linking to the Google-related pages and content in the footer with links to the relevant pages (as well as in the services menu)? I assume that links to location pages would be excellent as well. Typically, I also include the business NAP in the footer and sometimes an embedded GMB map. I guess, basically, I’m looking for the ‘perfect’ footer (and local site navigation) – ha. I do, but all the examples I know off the top of my head are of clients, and in this case I’m not at liberty to mention them that specifically. (If you’re a regular reader you probably know I often wheel out examples of clients.) But the good news is the setup I’ve described is pretty simple, and you’ve summarized the basics of it. Thanks for another well researched and tested article. I have never seen a one box but will be looking out for them.